We had a patient with interesting symptoms visit our practice at Plympton. Tom* is a 48 year old history teacher who has recently gotten back into running after a long hiatus. Tom* has decided to run in this year’s Adelaide Marathon in August, but has begun to notice some pain in his foot after running longer distances. Due to his history as a runner, Tom* knew the early signs for plantar fasciitis (heel pain) and came in for an appointment with us. On examination, Tom* fit the common signs and symptoms for plantar fasciitis. He had recently begun an intense running program and was experiencing a sharp stabbing pain in his heel. This pain was worse in the morning after his runs, and when wearing thongs on the weekend. He appeared to have flat feet, as well as tender plantar fascia (this is the flat band of tissue or ligament that connects your heel bone to your toes) and calf muscles. The Physio was able to provide some relief with soft tissue release and trigger pointing the plantar fascia and calf muscles. Tom* was given a stretching program and advised to purchase one of our small massage balls to continue self-treatment at home between appointments. Tom*’s running shoes were quite old and unsupportive, leading to an increased strain through his plantar fascia. 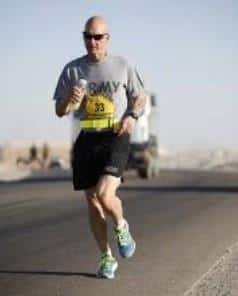 It was suggested that he try running in newer, more supportive shoes, and possibly seeing a Podiatrist to see whether orthotics were appropriate for him. Tom* and the Physio continued to meet for a couple of weeks. Tom* was experiencing improvement, but still was feeling some pain the day after a run. The Physio trialled dry needling in his calf to provide further release of the muscles supporting the ankle and plantar fascia. To minimise the strain through his foot, the Physio advised reducing his running program slightly, and altering his routes to run on softer surfaces, such as grass or sand. The Physio also stressed the importance of good shoes, and suggested avoiding thongs and bare feet for the time being. With the combined efforts of soft tissue release, stretching and a change in training Tom* began to return to normal. He still feels a little sore in his foot after longer training sessions, but he reports it being much more manageable. Thanks to the Physio, Tom* is now aware as to how he can relieve his pain, and knows how to adjust his training program to manage flare ups. Tom* is well on his way to recovery, and we wish him the best with the rest of his training for the Adelaide Marathon! Click here to find out how our Physios can help you with any sports injuries that you may be experiencing.